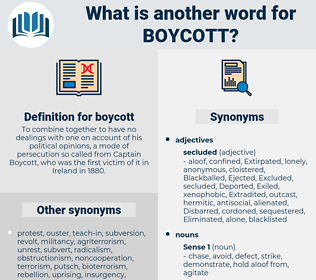 What is another word for boycott? To combine together to have no dealings with one on account of his political opinions, a mode of persecution so called from Captain Boycott, who was the first victim of it in Ireland in 1880.
include, approve, want, permit, buy, support, accept, allow, encourage, sanction, welcome, use. Also, there are rumors flying about that a boycott of French goods is shortly to be established. The village was a power nobody could boycott.